“Confirmation” is the process by which Christians affirm their baptismal vows and enter into full adult membership in the church. 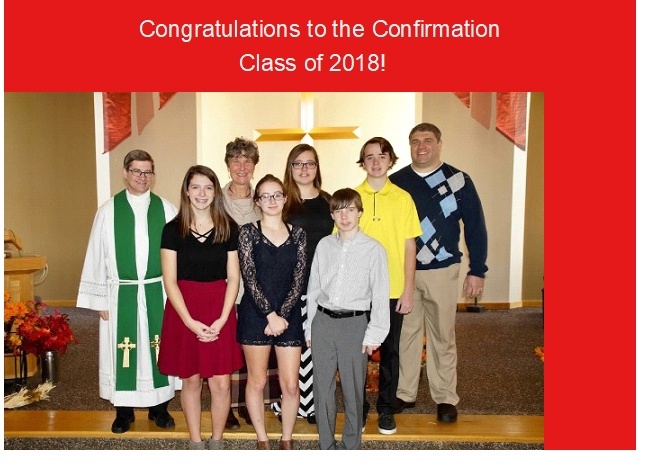 Class 6:30 to 8:00 p.m.
Grades 6-8 will be involved in Confirmation. All youth grades 6-12 are welcome to attend Wednesday Youth Nights. At this meeting, we will go through the details of the Confirmation process and the Sunday itself, deciding about how to handle cake and pictures, faith statements and worship participation, etc. We will also discuss the details of the Faith Statement Night (see below). This is a mandatory meeting. This is a mandatory event, during which the students will have an opportunity to choose their confirmation Bible verses, work on their faith statements, and socialize. Adult chaperones are needed. Details to follow.